Home and business owners looking to buy networking gear face an array of choices. Many products conform to the 802.11a, 802.11b/g/n, and/or 802.11ac wireless standards collectively known as Wi-Fi technologies. Bluetooth and various other wireless (but not Wi-Fi) technologies also permeate the market, each designed for specific networking applications. For quick reference, 801.11aj is the most recently approved standard. The protocol was approved in May 2018. Just because a standard is approved, however, does not mean it is available to you or that it is the standard you need for your particular situation. Standards are always being updated, much like the way software is updated in a smartphone or on your computer. In 1997, the Institute of Electrical and Electronics Engineers created the first WLAN standard. They called it 802.11 after the name of the group formed to oversee its development. Unfortunately, 802.11 only supported a maximum network bandwidth of 2 Mbps — too slow for most applications. For this reason, ordinary 802.11 wireless products are no longer manufactured. However, an entire family has sprung up from this initial standard. The best way to look at these standards is to consider 802.11 as the foundation, and all other iterations as building blocks upon that foundation that focus on improving both small and large aspects of the technology. Some building blocks are minor touch-ups while others are quite large. The largest changes to wireless standards come when the standards are "rolled up" to include most or all small updates. So, for example, the most recent rollup occurred in December 2016 with 802.11-2016. Since then, however, minor updates are still occurring and, eventually, another large rollup with encompass them. Below is a brief look at the most recently approved iterations, outlined from newest to oldest. Other iterations — 802.11ax, 802.11ay, and 802.11az — are still in the approval process. Known as the China Millimeter Wave, this standard applies in China and is basically a rebranding of 802.11ad for use in certain areas of the world. The goal is to maintain backwards compatibility with 802.11ad. Approved in May 2017, this standard targets lower energy consumption and creates extended-range Wi-Fi networks that can go beyond the reach of a typical 2.4 Ghz or 5 GHz networks. It is expected to compete with Bluetooth given its lower power needs. Approved in December 2012, this standard is freakishly fast. However, the client device must be located within 11 feet of the access point. The generation of Wi-Fi that first signaled popular use, 802.11ac uses dual-band wireless technology, supporting simultaneous connections on both the 2.4 GHz and 5 GHz Wi-Fi bands. 802.11ac offers backward compatibility to 802.11b/g/n and bandwidth rated up to 1300 Mbps on the 5 GHz band plus up to 450 Mbps on 2.4 GHz. Most home wireless routers are compliant with this standard. 802.11ac is also referred to as Wi-Fi 5. 802.11n (also sometimes known as Wireless N) was designed to improve on 802.11g in the amount of bandwidth it supports, by using several wireless signals and antennas (called MIMO technology) instead of one. Industry standards groups ratified 802.11n in 2009 with specifications providing for up to 300 Mbps of network bandwidth. 802.11n also offers somewhat better range over earlier Wi-Fi standards due to its increased signal intensity, and it is backward-compatible with 802.11b/g gear. 802.11n is also referred to as Wi-Fi 4. In 2002 and 2003, WLAN products supporting a newer standard called 802.11g emerged on the market. 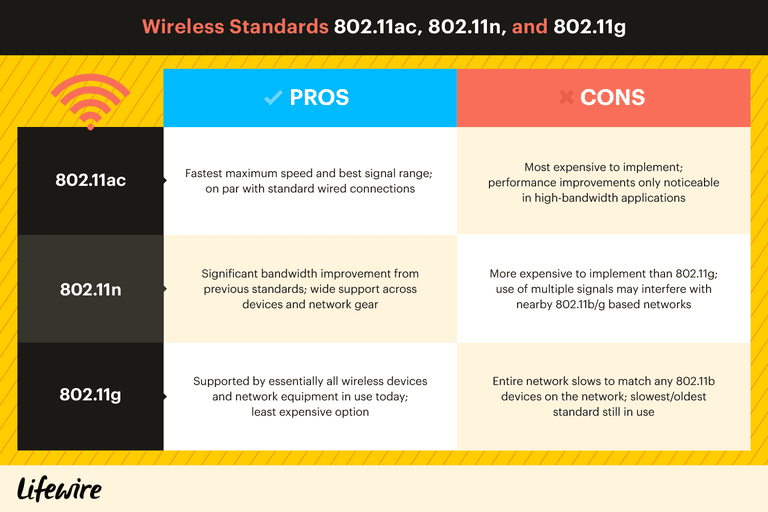 802.11g attempts to combine the best of both 802.11a and 802.11b. 802.11g supports bandwidth up to 54 Mbps, and it uses the 2.4 GHz frequency for greater range. 802.11g is backward compatible with 802.11b, meaning that 802.11g access points will work with 802.11b wireless network adapters and vice versa. 802.11g is also referred to as Wi-Fi 3. Because 802.11a and 802.11b use different frequencies, the two technologies are incompatible with each other. Some vendors offer hybrid 802.11a/b network gear, but these products merely implement the two standards side by side (each connected devices must use one or the other). 802.11a is also referred to as Wi-Fi 2. IEEE expanded on the original 802.11 standard in July 1999, creating the 802.11b specification. 802.11b supports a theoretical speed up to 11 Mbps. A more realistic bandwidth of 5.9 Mbps (TCP) and 7.1 Mbps (UDP) should be expected. 802.11b is also referred to as Wi-Fi 1. Aside from these five general-purpose Wi-Fi standards, several other related wireless network technologies offer slightly different value propositions. IEEE 802.11 working group standards like 802.11h and 802.11j are extensions or offshoots of Wi-Fi technology that each serve a very specific purpose. Bluetooth is an alternative wireless network technology that followed a different development path than the 802.11 family. Bluetooth supports a very short range (approximately 10 meters) and relatively low bandwidth (1-3 Mbps in practice) designed for low-power network devices like handhelds. The low manufacturing cost of Bluetooth hardware also appeals to industry vendors. The Official IEEE 802.11 Working Group Project Timelines page is published by IEEE to indicate the status of each of the networking standards under development. Wireless FAQ - What Is 802.11?